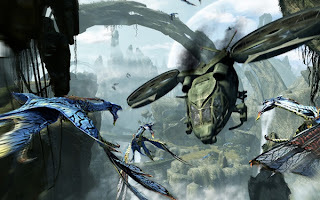 Avatar's producer Jon Landau, caught up with Empire and gave up some info on the sequels and the rumours that Avatar 2 will take us to the depths of Pandora's oceans. "Water will be a part of the movie, but it won’t be all of the movie, " Landau told us. "There’s been a lot of rumours that it’s an underwater movie – it’s not. Just like the Floating Mountains, and the Na’vi's interaction with the mountains, were a part of Avatar, it’ll be the same type of thing." So will the sequel launch Jake Sully into orbit and on to new planets? No, says Landau. "I think the next movie will stay on Pandora. That’d be my guess. Not all the answers are there yet, but I think we’re happy with Pandora." Landau also stressed that Avatar 2 won't leave narrative theads hanging, Hallows-style. "The next [film] will kick off where the next last one ended, but, just like Avatar resolved itself and doesn’t feel like a set-up to another movie, you don’t want Avatar 2 to feel like a set up for 3." So with Cameron and his Lightstorm partner heading back to Pandora for the next few years, where does that leave manga adaptation Battle Angel and freediving drama The Dive? "They’re further-out projects," says Landau. "Neither one has that shooting script yet and both are really worthy projects to make." I'm reading: [AVATAR 2] WILL NOT BE A SEA MOVIETweet this!